You see you've got a comment! Yay! For some bloggers, this is an exciting event. It an even make their day. Even for me I get that quickening in my stomach that someone has not only read my posts, but has also bothered to say something about it. A single word comment - wow! My expectant face suddenly collapses. What do you mean 'nice'? Nice post, nice point, nice quiz, nice subject, nice what? A single word comment is not a helpful comment. It's not appreciated it because I'm not getting any value from it and it isn't telling me anything. In other words, it is a waste of my time. It isn't even complimentary – it's a nothing comment. Just like the awkward teenager who is desperately trying to say something to the pretty girl he has fancied for – like – ever, he is suddenly tongue-tied. And all he can blurt out is one word. It isn't the word he wants to say, but his brain goes into spasm and doesn't work properly. And the word that does emerge is totally inappropriate, useless, wrong! Is this commenter like this? I don't think so. There must be another reason. Maybe he wasn't very bright, and couldn't think of anything to say except 'Nice'. This phenomenon is quite prevalent on the Internet, there seem to be loads of stupid people whose brains give up at the sight of a comment box in any interactive medium. He could have been lazy, and couldn't be bothered to write any more than a single word comment. I doubt he spent any time thinking about what to say, but felt there was a need to say something, anything, just to satisfy the need to comment. Is this helpful to me? No single word comment is helpful. It doesn't contribute to the conversation, or add value to the post. Writing 'Nice' may seem to him to be friendly and forthcoming, and certainly it isn't a horrible word, but it doesn't stimulate me into wanting to reply to him. Because that is one of the reasons why people should comment. They should encourage a reply from the post's author. The commenter has offered feedback about the content, and it is only polite for the blogger to respond appropriately. There is nothing for me to reply about. He hasn't offered any advice, thoughts, opinions or a point of view. He hasn't asked a question, presented any challenging idea, or even opposed the content of my post. What have I got to go on to write a reply? Is this helpful to the commenter? Other reasons why people comment is to get recognition for themselves, their expertise, their point of view and maybe even to strike up a blogging relationship with the author. But how can a single word comment do this? Writing 'Nice' doesn't show any knowledge, it shows appreciation but no opinion, and why would I want to add him to my fanbase if that is all he can manage? I don't even know what he looks like, as he doesn't sport a gravatar. His name 'ales' equally says nothing. It could be a name, or a product, or a company or goodness knows what. He hasn't left a URL to a website or blog, so I can't even go and read anything he's written (not that it would be worthwhile if all he is capable of writing is a one word post!). I'm surprised this single word comment managed to make it onto my comment approval queue. This is the sort of thing my moderating software would pick up on and treat as spam. It is a trait that spammers used to do in the past, just to get a toehold into the blog and do their worst with the link behind their names. A single word comment was enough, especially if a comment-starved blogger was grateful for whatever feedback he could get! Buy nowadays these are let through. Spammers have become more clever in the past, and know they have to write a bit more than a single word comment if they are to succeed with their devious pursuits. What would other readers think? If I was to accept and publish this single word comment, what would my other readers think? What example would it give to them? The last thing I would want is to encourage my other readers to think it was OK to write such inadequate comments. Comments aren't only for the post's author, they're also for the other readers. A good comment could stimulate responses from other commenters; acknowledging it, defending the author's point of view or even adding their own value to the subject. A good comment would also relate to anyone who read it, forcing them to think in agreement, see themselves within the point raised or stimulate other ideas that are worth noting. A single word comment like 'Nice' doesn't do anything like that. What do you think about one word comments? Do you suffer from the same predicament? How often are you dismayed at finding a single word comment in your comment moderation queue? How do you respond to such a thing? Let me know in the comments below (more than one word please!) and tell me if you find this as annoying as I do. We would love to hear from you. 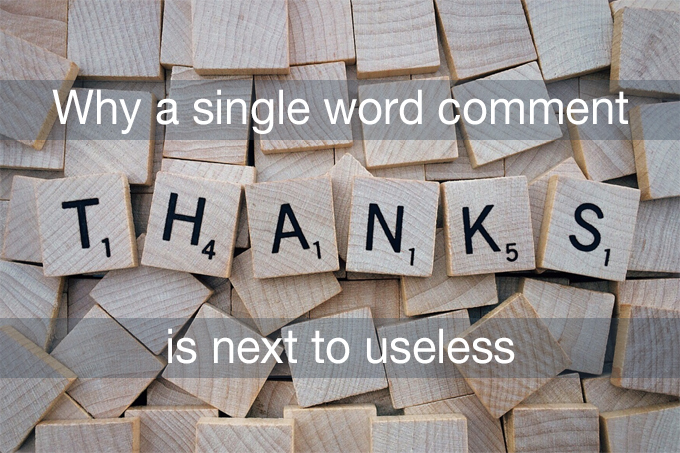 Do you have a preferred way of sharing appreciation? Especially if that’s the only reaction we as commenters have to a post? These are really good questions, Paul. The answer is to write more than the usual generic phrase such as ‘nice post’, which is meaningless and unhelpful. Every post deserves a considered and well thought-through response. I would suggest greeting the author by name, confirm you’ve understood the post, offer an opinion and then finish off with a thank you or a summary of the bigger picture. This may seem to you to be a lot to write, but with practice this could become second nature and take less time to perform the more adept you become at commenting.